Samsung has taken their popular NX10 and shrunk it down to form the NX100. With loads of useful exposure options, robust performance, and excellent image quality, the NX100 is a formidable opponent in the compact EVIL category. Read more in our Full Conclusion. 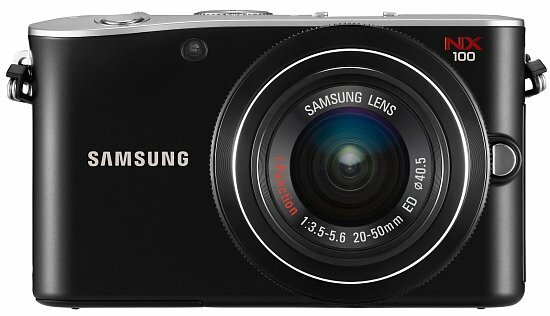 Samsung continues to set the tone in the EVIL market of mirrorless digital cameras. First it was with the introduction of the NX10, which was the first EVIL (Electronic Viewfinder Interchangeable Lens) camera on the market to use an APS-C sized image sensor in such a small form factory. Now, with the NX100, Samsung is unveiling yet another first for this class of powerful digital cameras with their new i-Function lenses. This new system allows photographers to control commonly used camera functions (like shutter speed, aperture, ISO, exposure compensation) quickly and easily without ever having to remove their left hand from gripping the lens barrel. This is accomplished with the use of an i-Function button and a control ring on the lens; which also serves the manual focus ring. The NX100 carries over many of the same features found on its predecessor, the NX10, including a 14.6-megapixel APS-C CMOS image sensor, a 3.0-inch AMOLED display, 720p HD video recording and much more. However, all these are packed into a much smaller frame. With this compact size, there are some features lost, like the awesome built-in EVF that was on the NX10. However, Samsung has done well by offering external accessories like an EVF that attaches to the flash hot shoe; much like Olympus' PEN models. Shutter speeds of 1/4000sec. ~ 30sec. Optional accessories: EVF, GPS Module, etc. The NX100 zoom kit is avaiable now for about $549.99 US, and comes in Black, White, Silver, and Brown.